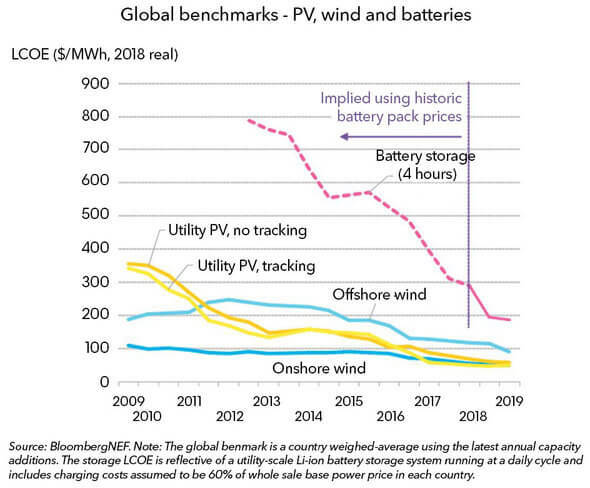 The latest analysis by research company BloombergNEF (BNEF) shows that the benchmark levelized cost of electricity, or LCOE, for lithium-ion batteries has fallen 35% to $187 per megawatt-hour since the first half of 2018. Meanwhile, the benchmark LCOE for offshore wind has tumbled by 24%. LCOE measures the all-in expense of producing a MWh of electricity from a new project, taking into account the costs of development, construction and equipment, financing, feedstock, operation and maintenance.